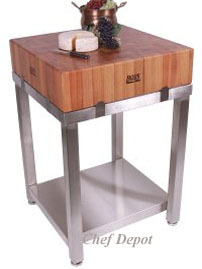 Maple Kitchen Tables , Prep Carts , Butcher Blocks and Swivel Stools are on sale! 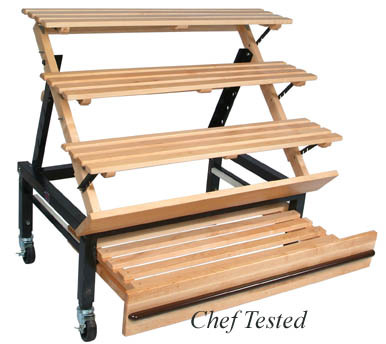 These maple kitchen tables, prep carts and butcher blocks are the best we have tested. John Boos has been making high quality products since 1887! Made in the USA! The Cucina Americana line combines function with style, select solid maple tops and heavy duty stainless steel. Most items are In Stock! We have the fastest delivery on all John Boos Products! With proper care these tables can last for generations! 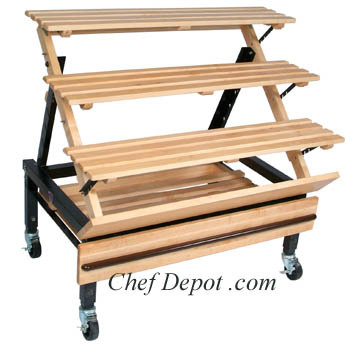 These carts and tables are used by Gourmets & Chefs around the USA! We know John Boos, call us (630) 739-5200 Top 10 reasons you should buy your John Boos Products from Chef Depot! Find a lower price on any John Boos Product and we will beat it! Free Shipping! Click here to read some of the Chefs comments. Commercial & Restaurant Tables. 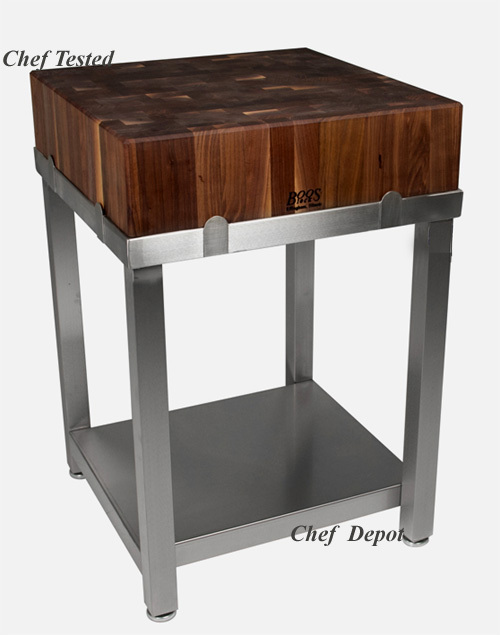 We have great prices on these USA made Butcher Blocks ! Free Shipping & Good Customer Service! The Laforza Block has a 6 in. Thick Solid Maple 24 in. x 24 in. End Grain Top. It comes standard in Maple but is now also available in Cherry wood. The block and base can be ordered separately. The block makes an excellent counter top section in any kitchen! The overall table stands 36 in. high. The frame is made from food service grade stainless steel with a stainless steel lower shelf and adjustable feet for leveling. The top plus the base weighs 129 lbs. We can deliver this block in approx. two weeks! This block has a FDA approved food safe natural finish. Sale Price $1068.00 with Free Shipping! Sale - Call Us or Email Us ! Sale Price $459.00 with Free Shipping ! Sale Price $629.00 with Free Shipping! Sale Price $1299.00 with Free Shipping! Sale Price $609.00 with Free Shipping & Spectacular ***** Customer Service! Walnut Laforza Block (block only) $1299.00 Made in USA Sale - Call Us or Email Us! Laforza Base (base only) $609.00 Made in USA Sale - Call Us or Email Us! We have the Fastest Delivery on these Tables! The Grandioso kitchen island workstation has a hard maple 1-3/4 in. thick top and food service grade 300 series 18/8 stainless steel base. It includes (1) 20 in. x 15 in. stainless steel drawer with roller bearing drawer slides for easy opening and many years of reliability. You can also build your own table, see below. The adjustable stainless steel undershelf is perfect for storing mixers and cookie pans! 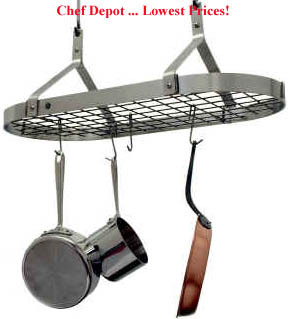 The overhead stainless steel pot rack will hold, pots, pans and utensils. It comes with 15 Heavy Duty stainless steel hooks ( more avail. below). The table top is 36" tall and the overall height is 84" inches. This table has a FDA approved food safe natural finish. The butcher block top requires rubbing with Mystery Oil or Wood Cream (below), every month to keep it looking new. We can ship your new butcher block table in aprox. 3 - 4 weeks! Choose from several sizes below! Call for Designer discounts. Sale Price $2096.00 with Free Shipping & Great Customer Service! Sale Price $2228.00 with Free Shipping! Sale Price $2168.00 with Free Shipping! Sale Price $2323.00 with Free Shipping! Sale Price ADD TO CART TO SEE PRICE , Free Shipping! 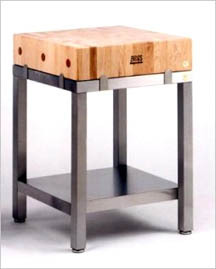 We have the Lowest Prices on John Boos Blocks & Tables! Fastest Delivery on these Tables. With Free Shipping & Mystery Oil & Customer Service! "Build A Table" Grandioso kitchen island workstation has a hard maple 1-3/4 in. thick top and food service grade 300 series 18/8 stainless steel base. The adjustable stainless steel undershelf is perfect for storing mixers and cookie pans! Choose your size, then choose your options below! Options - 20 in. x 15 in. stainless steel drawer with roller bearing drawer slides for easy opening and many years of reliability. The overhead stainless steel pot rack will hold, pots, pans and utensils. Heavy Duty stainless steel hooks (avail. below). The table top is 36" tall. With potrack the overall height is 84" inches. This table has a FDA approved food safe natural finish. The butcher block top requires rubbing with Mystery Oil or Wood Cream (below), every month to keep it looking new. We can ship your new butcher block table in aprox. 3 - 4 weeks! Choose from several sizes below! Free Shipping & Good Customer Service! Made in the USA Sale - Call us or email us for special sales! Call to order or email questions! We have the fastest shipping on all John Boos Blocks & Tables! Free Shipping & Customer Service! Our new Bakery Display Cart measures 36 in. x 48 in. adjustable pop up 9.25 in. shelves and features Solid Red Oak construction. Solid welded steel construction with black powder coating. This cart has non marring food service grade locking caster wheels! Price goes down with quantity, call us. More Bakery Display Carts are here! Call us for quantity discounts and sale prices. Call us for other sizes and prices. More Bakery Display Carts are here! 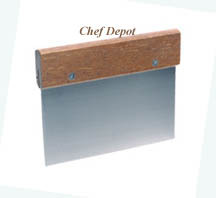 Our Wood Dough Bench Scraper is perfect for working with pastry, bread and pizza doughs! Every baker needs a good scraper! This scraper features a 6 in x 3 in. stainless steel blade and a riveted solid wood handle for years of performance! Chefs Note: I like to use mine for cutting portions of pizza dough and scraping down the flour on my butcher block. Also a great tool for scraping clean your hardwood cutting boards! This is a type 300 stainless steel double overshelf. Fits the stainless tables above and fits on our wood top tables. Rear mount is standard, but we also do center mount. Rear mount shewlves have a 1 1/2 in turned up riser (keeps things from sliding off) One of two shelves avail., First shelf is 18 in. above work surface with second shelf 12 in. above first! Call for sizes and prices. 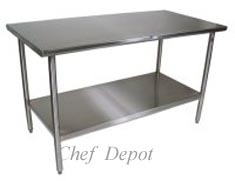 Our favorite Stainless Steel Equipment Stand features 16 Gauge commercial food service grade stainless steel (18/8 grade), it has a reinforced medium polished top and solid stainless steel base, under shelf and legs . NSF certified for safety and approved for food service use. It also has adjustable feet for leveling. This table is available in many sizes below, other sizes may also be available. Shipped knocked down. A fully welded version is avail. for 99.00, click button and add to comments when ordering and email us. we can ship yours in aprox. 4 weeks! Other sizes/styles are available, incl. no lower shelf, call us. Free shipping in the continental USA only! This is the John Boos Stainless Steel Mensola Pot Rack. These pot racks are made from high quality foodservice grade stainless steel with solid stainless hooks. They are attractive, functional and made to last! 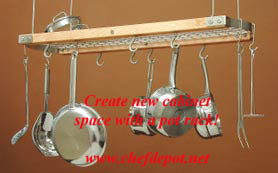 The pictured pot rack includes the hooks to keep everything in place! Free Shipping with any Pot Rack! We can ship your new pot rack in aprox. 1-2 weeks! Highest Quality! Made in the USA! Lowest Prices. Chef Tested Quality Knife Sets! Click Here! Vanilla from Madagascar! The Best! Our contemporary rack presents the timeless elegance of our oval racks in a less-fussy, low maintenance, stainless steel finish. This rack is 32"L X 15"W X 15"H, Easily mounts on 16"centers, 12 hooks included, Shipping weight 18 lbs. This potrack is available with or without the center grid. Chefs Note: Possibly our favorite stainless steel pot rack! Free Shipping, No Tax & Great Customer Service! Click Here for more Enclume Pot Racks! Our Microwave Shelf is made from heavy duty 16 gauge type 304 stainless steel! It has a high nickel content and will never rust or stain. Made in the USA to last forever. It features recessed mounting supports. Move your microwave up to a convenient eye level and free up valuable counter work space! Choose from 2 sizes. Add a Chef Table to your kitchen! Our new Stainless Steel Wall Shelf is made from heavy duty 18 gauge type 304 stainless steel! It has a high nickel content and will never rust or stain. Made in the USA to last forever. It features recessed mounting supports. 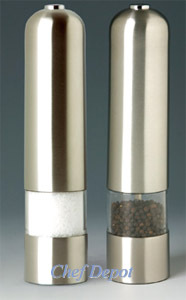 Move your spices and kitchen gadgets to a convenient eye level and free up valuable counter work space! A great choice for shops, offices and bathrooms too! Choose from many sizes below. Call for 16 ga. & 14 Ga. Options and builders discounts. Free Shipping in Cont. USA only! 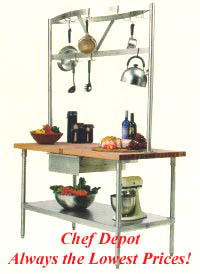 This is the John Boos Stainless Steel Galley Pot Rack. The pictured pot rack includes the optional rail bar and hooks to keep everything in place! 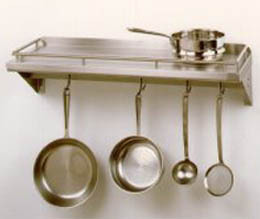 The pot rack is also available as a wall shelf only (no bar and hooks). We also carry the full line of Enclume Iron, Brass & Copper Pot Racks, at low prices! Free Shipping is available in most areas of the continental USA only. Click links below to view more products! Click the green arrow on the right for more Boos products!